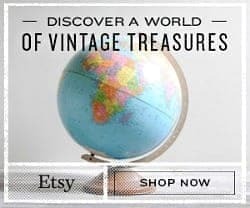 Rothenburg ob der Tauber is a shopping mecca for many visitors to Germany, and we want to share some of our favorite souvenir ideas from our time in Rothenburg. Rothenburg ob der Tauber is a small medieval town along Germany’s Romantic Road. The little town offers picture perfect medieval views, but it can also be overrun with hordes of tourists, especially in December and during the Summer months. While there are a number of interesting things to do in Rothenburg that should not be missed, this post will focus on shopping in Rothenburg. In all honestly, neither Ethan nor I are big shoppers when we travel, but we happened to be in Germany at the same time as two loved one’s birthdays and a wedding so we ended up needing to do a bit of shopping during our time in Rothenburg. During our hunt for some perfect gifts, we discovered a lot of interesting shops and stores. Rothenburg ob der Tauber offers just about every German trinket and souvenir you can think of from cuckoo clocks and beer steins to German cookbooks and postcards. However, we’ll share our thoughts on some things that are either specifically unique to Rothenburg ob der Tauber or items that there was a particularly good selection of in Rothenburg. We focus our list of souvenirs on things that are more unique to the town, but you can of course still purchase common souvenirs like magnets, shopping bags, t-shirts, and postcards. One of our favorite shops we discovered in Rothenburg ob der Tauber was the Ernst Geissendörfer Art Shop. 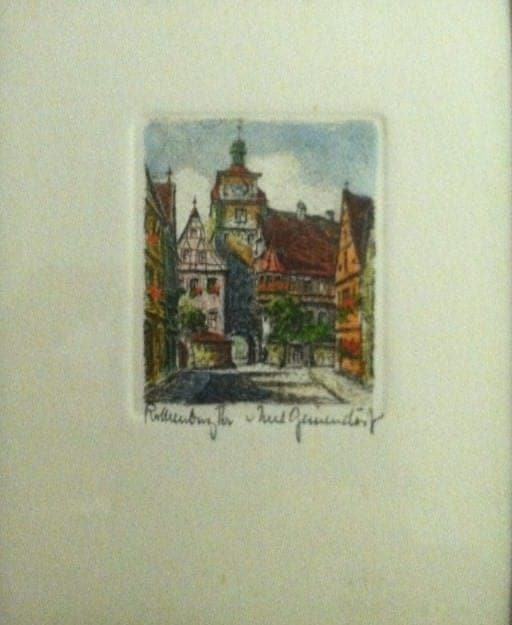 It has been around since 1908 and offers a wide selection of prints and original etchings, many of these featuring scenes of Rothenburg and other German cities. We enjoyed our time learning about how the etchings are created from Frau Geissendörfer as we were unfamiliar with this traditional process. The etchings and prints range widely in price and many of the more expensive are not on display so just ask if there is something in particular you are interested in seeing. I purchased a colored print of Rothenburg here as a gift for a friend, and regret not buying one for myself as well. You can find this shop on the corner of the Market Square at Obere Schmeidgasse 1. You can also check out the Galerie Zum Burgtor which is a gallery of etchings from multiple artists located at Herrngasse 22. 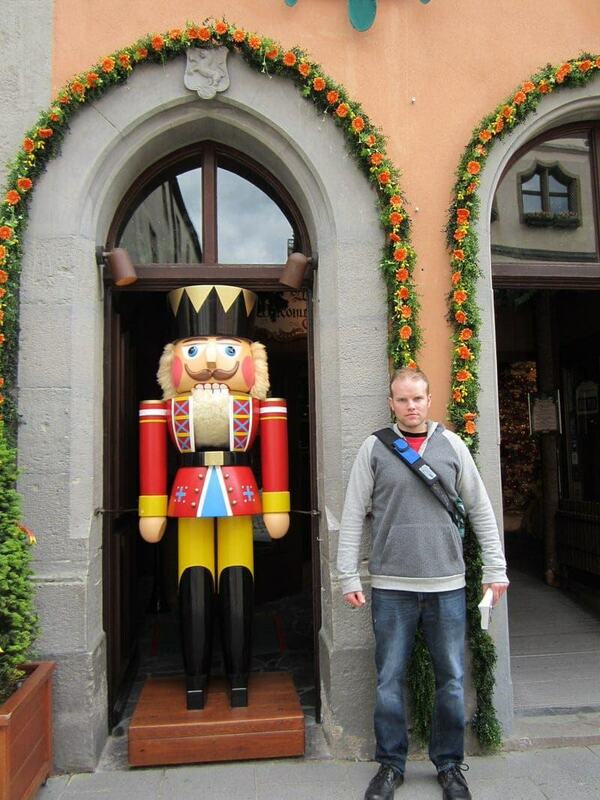 You can celebrate Christmas in Rothenburg even in July! It is almost impossible to walk around the town and miss the giant Käthe Wohlfahrt flagship Christmas Village souvenir store. 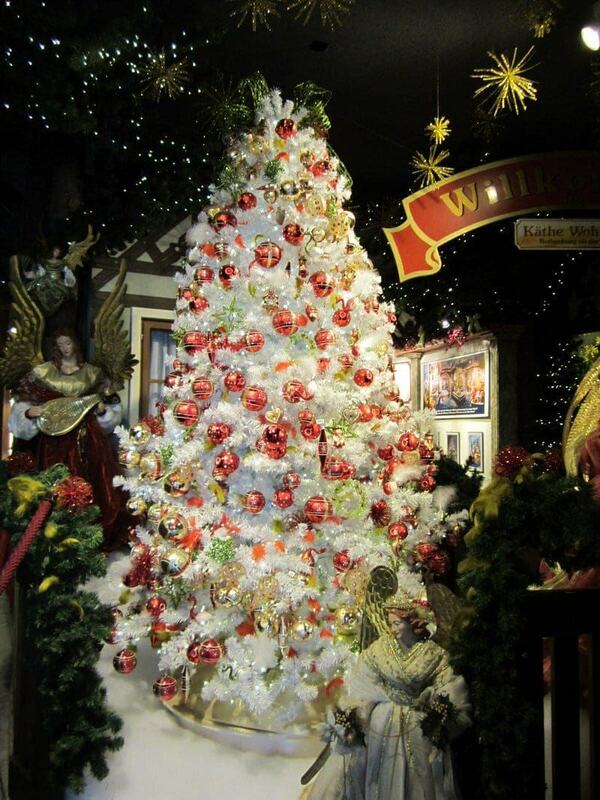 Walk pass a giant nutcracker soldier and follow the sounds of Christmas tunes to find yourself in a Christmas fantasy land that offers just about every type of Christmas ornament and tree decoration imaginable. If you aren’t interested in tree decorations, you can also find nutcrackers, music boxes, table top decorations, table linens, candle holders, nativity scenes and a number of other Christmas related decorations offered at both the giant Christmas Village (Herrngasse 1) and the smaller Käthe Wohlfahrt “Christkindlmarkt” (Herrngasse 2) across the street. Rothenburg ob der Tauber is a good place to check out the local Franconian wine. Franconian wines are known for their unusual bottle shape (short and round) that is known as a “Bocksbeutel”. You can sample Franconian wine at most of the restaurants and pubs in Rothenburg, and the annual wine festival takes place in mid-August. If you like it, you can buy and ship some of these stubby bottles back home. 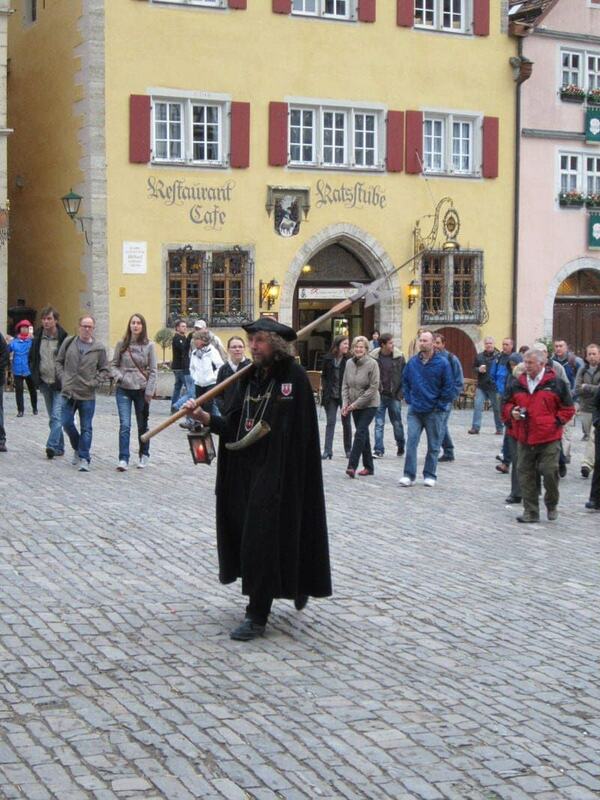 Like most visitors to Rothenburg, we took the hour-long Night Watchman’s Tour, which is a funny yet informative evening walking tour focused on the history of Rothenburg. If you enjoy the tour, but are still interested in finding out more about the history of Rothenburg, you might consider buying the DVD sold by The Night Watchman (a.k.a. Hans-Georg Baumgartner) at the end of each tour for $15 that contains information from the tour plus additional information on the history of Rothenburg. These can also be purchased at his online shop. 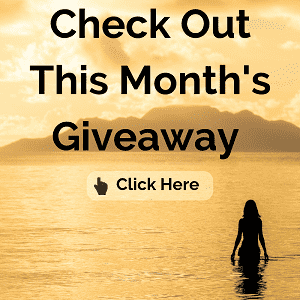 The Night Watchman – the most followed man in Germany! Several shops in Rothenburg sell German games, puzzles, dolls, and teddy bears. In particular, we noticed at least two places devoted almost entirely to teddy bears. If you are traveling with children or want to pick up some gifts for some kids back home, you’ll have a lot of options to choose from in Rothenburg. Some places to check out are the whimsical Käthes Spielzeugladen (a.k.a. The Magic Mushroom at Grüner Markt 9) which sells a variety of German toys and games, and two places that specialize in cuddly teddy bears: TeddyLand (Herrngasse 10) and Teddys Rothenburg (Obere Schmiedgasse 1 ). You can get discounts at many of the Rothenburg ob der Tauber shops if you have the latest Rick Steves’ Germany guidebook. 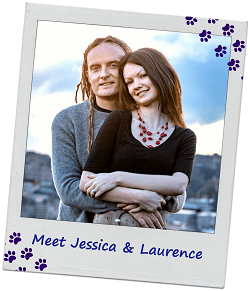 A couple of the local shopowners explained to us that they have known Mr. Steves for years and have been listed in his guidebook since he first started his guidebook series. Discounts generally range from 5% to 10% off your purchase. 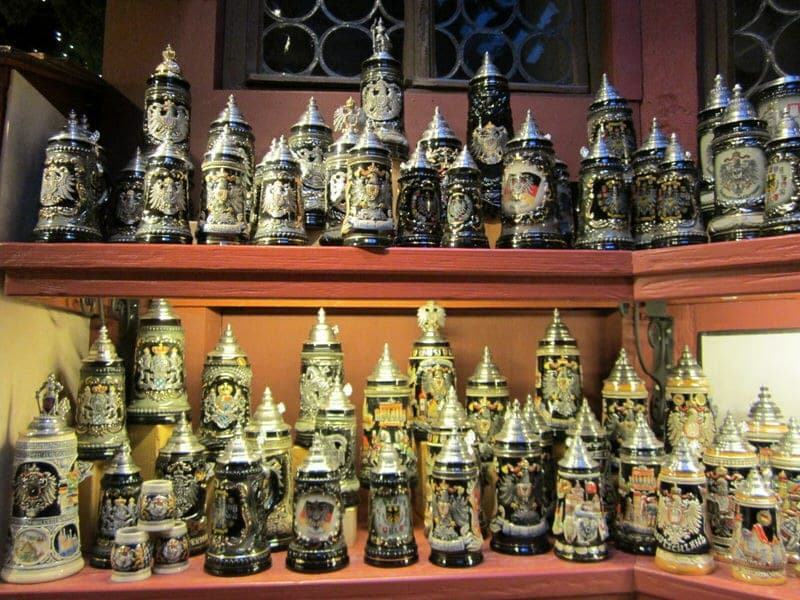 So there you have it, our list of the top souvenir and gift ideas from Rothenburg ob der Tauber, Germany. If you have any questions or have some other suggestions, we’d love to hear them! Also, don’t miss some of our other articles about our time in Rothenburg. I have two etchings in color. One is an old women with her vegetables in an old basket. The other is an old man with his basket full of vegetables. I bought them in 1963 when I was there. The pictures are signed by the artist. I can not read his name. He was a very old man and perhaps not living when I bought the pictures in 1963. I am looking for the shop with the Koh brand tealight votives. They are very colorful and some have village scenes on them. The store was on the main road you come to when entering the town through the gate where the buses drop off I believe. I have just returned to the USA from a wonderful vacation in Germany and Austria. We stayed for a few days in Rothenburg (a fairy-tale town) where I bought four, small, wooden ornaments which are suspended from a spiral wire that allows them to dance up and down. My grandaughter loves the one one I gave her and I would like to get a few more for her birthday. Please tell me the name of the shop from which I can buy these ornaments. I am trying to find the name/website of a lovely gift shop owned by a nice lady named Angela. She sells hand painted wooden figures as well as pewter ornaments and many other Christmas decorations. Thanks. 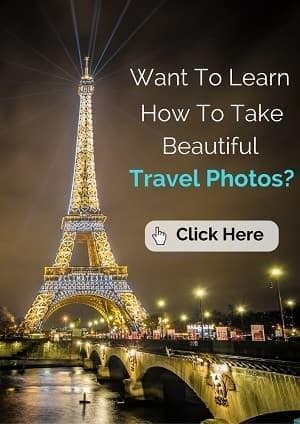 I wish I had this guide when I went last year! I completely forgot about clocks when I went over to Germany so when I came back and I did’t have one for my husband….he was a little disappointed haha. Found a spot though that I could order them from (http://www.bavarianclockworks.com/)…not the same as buying them in store but if you get desperate to get one, there’s options. Can’t wait till I can go back here, was such a neat city! Good luck and enjoy your time in Rothenburg ob der Tauber. I know that there were hats in some of the clothing and eclectic gift shops, but not sure if there were baseball hats specifically. What is shown on the picture above is not really a german Weihnachtsbaum (Christmas tree) but more like what a typical german imagines a typical american xmas tree to look like. They’re catering to their customers …. Hi Fabian, the tree in the picture is not for sale, it is just a giant tree for decoration in the store. The stores sells a wide variety of Christmas decorations, many look very much like my German grandmother’s ornaments while many resemble typical American ones. Actually as you probably know, the original German trees were decorated with food (fruits, nuts) and wax candles – not very safe today! We were in Rothenberg last October….do you know the name or location of the linen shop there? I loved it so much! Welcome Cynthia! We loved our time in Rothenburg and I remember a couple of places selling linens. 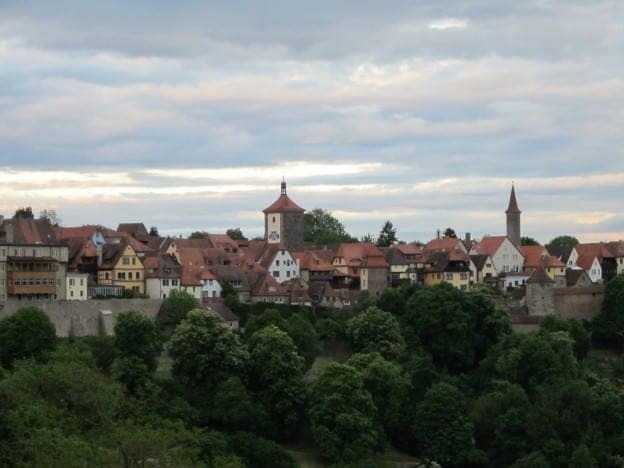 I don’t know the names or locations, but you could probably e-mail the Rothenburg tourism website folks and they could tell you: info@rothenburg.de If you find out, please come back and share the info with us so other readers can have that info too! I was in Rothenburg a few summers ago and loved it! It was overrun with tourists, like you said, but it was just so much fun that the hordes of people didn’t even bother me. It was July, but I bought Christmas presents for everyone. Did you guys get to try a schneeball while you were there? Those were so tasty! I am glad this was helpful and it’s so nice to bring back good memories from childhood. The Christmas shop! It looks so beautiful, normally I would disapprove of anything Christmas-related and not in December but it just looks so pretty. Oh my, this would be very helpful for people who need a guide to souvenir shopping in Rothenburg! I’d certainly bear it in mind if I ever find myself in those parts. I especially loved the Christmas Village souvenir store! Christmas in July? I want in! Thanks for stopping by Dee! Yes, we actually got a bit lost in the festive Christmas Village store as it is so large!